SLOTROD65's Willys decals have been specifically designed to fit the Aurora T-jet Willys body, as well as the common reproductions from Model Motoring, RRR, and Johnny Lighning. They allow the modeler to create over a dozen different Willys. Although designed for the Willys, this decal set is uasble on other slot cars as well. Willys gassers were a staple on dragstips in the 1960's. High front ends, and blower scoops made them appear to be going full tilt even when they were at a standstill. 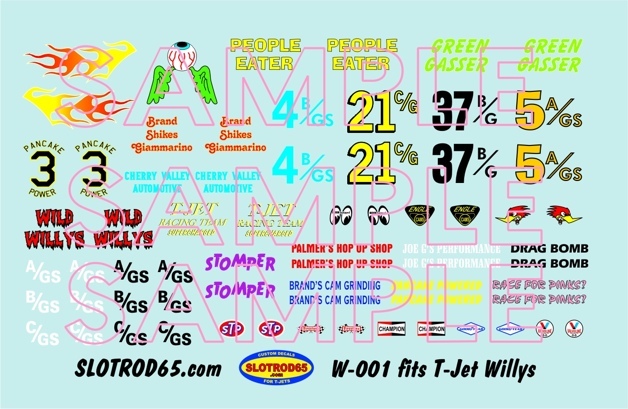 The slotrod65 Wild Willys decal set was inspired by photos of real vintage Willys dragsters, and combined with T-jet themes. In addition to the required numbers and class decals (A/GS, etc,) decals are included for Cherry Valley Automotive, Brand's Cam Grinding, Palmer's Hop Up Shop, and Joe G's Performance, as well as the racing team of Brand, Shikes and Giammarino. These, along with vintage sponsor decals will allow the modeler to create a variety of cars. *Please note that the actual decals are far sharper than the below sample.